You don't have to outrun the bear ... you just have to outrun the other guy. Often in business we only have to run a bit faster than our competitors to be successful. The same is true in risk management. While we would always like to anticipate and prevent risk from happening, when risk events do occur being faster, flexible, and more responsive than others can make a world of difference. Supply Chain Risk Management: An Emerging Discipline gives you the tools and expertise to do just that. While the focus of the book is on how you can react better and faster than the others, the text also helps you understand how to prevent certain risks from happening in the first place. The authors detail a risk management framework that helps you reduce the costs associated with risk, protect your brand and reputation, ensure positive financial outcomes, and develop visible, predictable, resilient, and sustainable supply chains. They provide access to a cloud-based, end-to-end supply chain risk assessment "Heat Map" that illustrates the maturity of the chain through the various stages. It should not come as a surprise to anyone that the world is a riskier place than it was just 15 years ago. A survey used to calculate the Allianz Risk Barometer recently concluded for the first time that supply chain risk is now the top concern of global insurance providers. For most organizations this new reality requires major adjustments, some of which will not be easy. This book helps you understand the emerging discipline called supply chain risk management. It explains the relevant concepts, supplies a wide variety of tools and approaches to help your organization stay ahead of its competitors, and takes a look at future directions in risk management-all in a clear, concise presentation that gives you practical advice and helps you develop actionable strategies. Complete and comprehensive coverage of supply chain risk - from strategic to operational to probabilistic modeling and analytics ... sufficient industry examples and guidance to assist organizations of all sizes and maturity levels ... . A valuable reference plus ample `how-to's.' A must for any firm participating in today's fast changing competitive environment. A comprehensive treatment of the rapidly-evolving discipline of supply chain risk management ... this book will give you valuable perspectives on supply chain vulnerabilities and how to deal with them. Robert Trent and Greg Schlegel have created a masterpiece for the risk practitioner. With a perfect blend of strategic thinking and ground-level tactical ideas, this book will serve readers for years to come in navigating the nascent field of supply chain risk management. A must-have for any risk management professional's library. Rich with meaningful examples, the authors explore the history of supply chain risk management, provide a solid foundation for understanding the concepts, and describe existing and emerging risk management frameworks. They further explore the use of pragmatic techniques to measure, track and report supply chain risk. Best of all, the authors present a path forward that any organization can use to start or improve a program to manage the increasingly important world of supply chain risks. As the nature of supply chains evolves with increasing globalization, consolidation and just in time inventories, the amount of risk continues to increase. 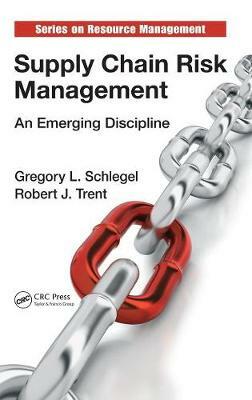 In this book, Trent and Schlegel have provided a timely and holistic view of this critically important discipline that's a "must-read" for any business leader or risk management professional. Using a proven approach and relevant tools and techniques, they have provided a framework that illuminates the full life cycle of identifying, assessing, and mitigating risks. The numerous examples and best practices neatly supplement the key concepts and fundamentals as well as the critical enabling capabilities required to ensure an effective risk management strategy. The chapters on analytics and risk measurement are especially insightful for those seeking to implement based on proven practices. The book is replete with examples of companies that have employed effective risk management techniques to gain a competitive edge. It should be required reading for any business seeking to accomplish the same. The first 'A-to-Z' margin-based Balanced Risk Assessment/Performance Guidebook to address our current and future global Supply Chain challenges! Fantastic! Guidance on the essentials of utilizing the optimum risk management method, tailored to your situation, the book facilitates management of the strategic, tactical and operation known knowns, known unknowns, and unknown unknowns. This back-to-basics approach respects that global supply chains are interconnected and evolving. Referencing the latest proven approaches and technologies, these Supply Chain resiliency guidelines can enable competitive advantage and profitable longevity. Finally, a comprehensive guide to profitable margin growth by linking internal end-to-end processes to suppliers and customers (markets).